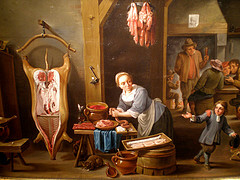 David Teniers 'Sausage Making. . . Grind all ingredients in a meat grinder. Knead the mixture well. 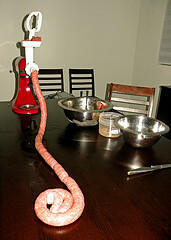 Tie a knot at one end of the sausage skin with one end of the string. Place the funnel attachment on the meat grinder. Attach a sausage skin and stuff it, leaving about 1” of skin to allow for shrinkage. Tie the sausage into four links and tie the other end shut. Prick each link several times with a pin. Smoke them. In northern Spain, the links are hung from the rafters or mantelpiece in the kitchen. They are left until needed. Wood is preferred fire for the aroma. Today, coat hangers are arranged over open fires from which the sausage is hung for a few hours. Perhaps it may be interesting to know that "Lucanian" has given name, in Northern Italy, to "lucanica" or "luganega", a kind of thick sausage. I imagine belly pork is the part used for bacon? In France I have tasted "andouilletes", a very rare sausage filled with tripes. To eat them you must be provided with a good stomach and a bottle of good red wine.